Seton Catholic High School in Chandler AZ Dresses Up Football Stadium! Located at 1150 North Dobson Road, Seton Catholic Preparatory High School is well known for its academic program. The school is also famous for its football program. The team is a four-time region champion and a two-time section champion as recently as 2012. Being state runners-up once in 2003, the team came home as state champions in 2012. Needless to say, the students, parents and community at large are proud of the achievements that these highly skilled football players display. As a result, the football stadium is a vital part of the school’s campus. Spotlight Signs and Imaging Solutions was honored when school officials asked us to provide the stadium’s entrance signage. The need for a new sign goes hand in hand with Seton’s continued expansion of the school. At this time, a new chapel, fine arts and academic buildings have been added. Since the concession and restroom facilities are directly connected to the stadium entrance, the entire frontage needed to undergo a bit of a facelift. When choosing football stadium signs, Chandler, AZ, venues usually opt for channel letters. They are durable, colorful and can be made to any size and depth requirements. 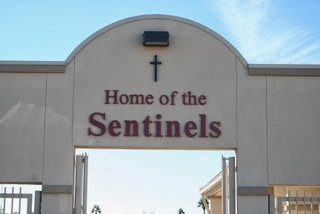 The Seton Sentinels needed red easy-to-read tall letters for their entranceway. This signage now points to the venue’s new concession stand and restroom facility for the football stadium. Is your school, sports league or community organization in need of new signage? We specialize in creating school signs Maricopa County, AZ, communities can be proud of. Acrylics and aluminum are perfect materials for channel letters. They are durable, versatile and highly visible. Whether you merely need lettering or also require a perfectly shaped logo to display alongside the words, there is no job that is too small or too big. Welcome players, students, parents, donors and community members in style. Why not host local politicians and take plenty of photos under the well-lit entryway of your stadium or building complex? If you already have a sign design in mind, bring us your drawings. If you are – as of yet – uncertain how your particular sign should look, talk to us for some ideas. We can help you decide on the font, size, color and overall appearance of the lettering. If needed, we can also discuss the advantage of lit as well as unlit channel letter signs. Do contact us for a free quote!